This project compliments last months dining table, one also made from American White Oak. Its worth saying something about what makes chairs different to any other piece of furniture. Personally I had made quite a few in my time and they present a challenge which I enjoy. A lot of cabinetmakers shy away from them because they aren't cabinets i.e. square carcasses. 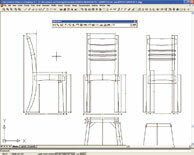 A chair is symmetrical from left to right and on plan view but assymetrical in other ways. Add to that the fact that there are a lot of ergonomic considerations and the back is invariably narrower than the front which then entails angled components and/or mortise and tenons, and the whole thing can seem more than a little offputting. Even designing it on paper or computer can be problematic because of the difficult angles and shapes involved. Here's how to do it without having a nervous breakdown: it really is very satishying when you do succeed. 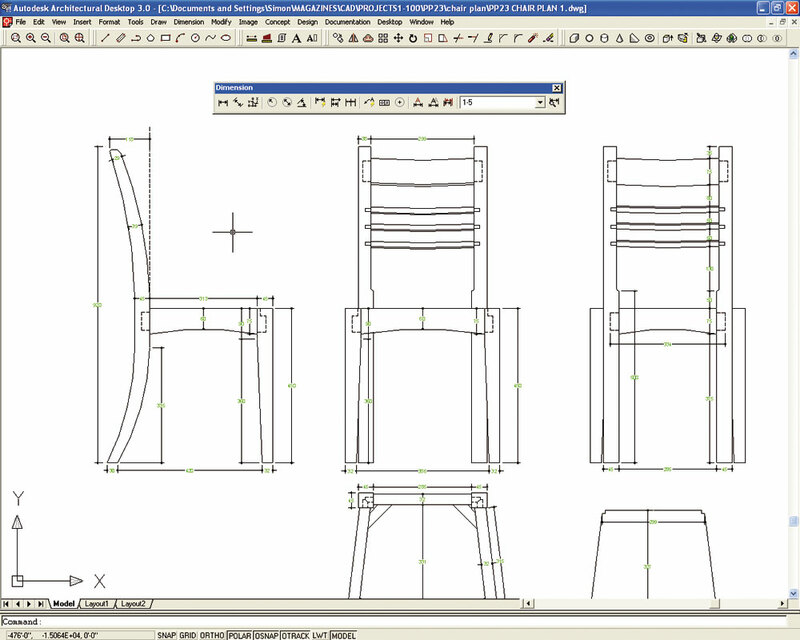 Using software to design a chair is easier than drawn methods, but we have made it easy for you by providing plans. 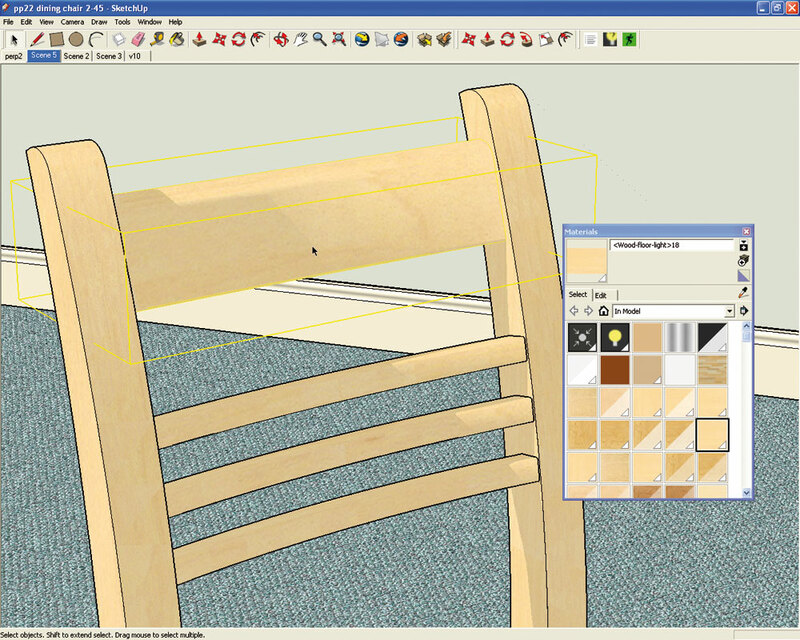 If you make this design there is no reason why you can't then go on and develop your chair design and making skills, so this is a good starting point. Programs such as AutoCad give you the tools to do this. It does take time to learn CAD programs but once you get the hang of it 2D drawing is surprisingly quick, and is enough for most purposes. 3D is good for client presentation but less important if you're making it for yourself. We have done all the hard design work for you, so you can concentrate on the making. 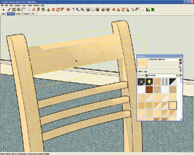 Because this is a finished design, strictly speaking making a mock up of the chair isn't necessary. However we all have different requirements, including height and leg length of the sitter and the position of the sitter's thighs vis a vis the skirt of the dining table. Previously I have always made mocked up chairs using MDF and softwood with long twinfast screws to hold it altogether instead of proper joints. This mock up can be sat on and adjusted until all the critical dimensions and comfort detail are right. The seat height minus upholstery is 450mm which is reasonably standard but can be adjusted slightly if necessary. The back is typical of a modern chair as it is raked back top and bottom for balance and back comfort. Ignoring the aesthetics for a moment, the key to building a chair is exactly the same as for a cabinet: it's the jointwork. The standard joint used in chairs is our good old friend the mortise and tenon. This can be straight, angled, square, flat or round, as in dowelled into matching sockets. So, when we are planning the making process, the need to accurately mark out and cut the M&Ts is crucial. Keeping components square before making the joints makes it easier to machine the mortises, thus the tapered front legs and the curved seat rails are much easier to work when left square. However, the back legs I generally bandsaw out and make a router jig or jigs for mortising them once they are accurately shaped. This shaping can be made precise using a 'pin on' jig and routing with a bearing guided cutter in a router table. Saw out and plane all components leaving them overlength, and where curved they need to be overwidth to allow for bandsawing out. There is scope for laying out the components on a typical board once thicknessed, so you minimise wastage, especially with curved section. Remember to avoid 'short grain' situations especially with the back legs where the grain should run parallel with the whole back section and not be angled as leg breakages are not uncommon. Avoid knots and other faults that will build in weaknesses in the structure. The back legs are the most complex joint-wise, but we have made it easier by having all mortises square in the wood, leaving the tenons angled instead. I must stress it is important that the legs match and fit the jigs properly for mortising. The jig needs to be reversible for left and right hand joints and another jig or a mortise box is needed for the front facing mortises. The side fitting jig has guide bush apertures for the back rails and the lower seat rail. The front legs are easier as these sections are square to start with and will fit in a mortise box for use with a router or can be machined with a chisel mortiser. The seat rail tenon sides are straightforward as they can be cut on the bandsaw using the straight fence and the mitre fence, likewise the front and back rail faces. The side rail faces are angled cuts and can be done by eye against pencil lines drawn on the timber. It is possible to make a jig but freehand works well. The back rails can also be hand sawn or done on the bandsaw. By lying the curved components on the bandsaw table it is possible to make the cuts. The back legs have previously been shaped apart from the narrowed inner side faces, the seat rail and back rails which are tenoned but also need their shaping. This is another job for the bandsaw. Saw close to the bandsawn lines and clean up with a spokeshave or belt sander. If you are making a set you can also use a 'pin on' jig to give accurate shaping before final sanding. However the topmost back rail is quite tall and needs care in shaping being too wide for a spokeshave. If you use a belt sander it is better to use it sideways so you don't damage the tenons, use a medium or fine belt as there will be a lot of scratch removal required when using an orbital sander afterwards, on the inside curve use only the front roller of the belt sander with the grain. The assembly of each chair has to be done in one session but there is an order to it. First the entire back with all rail tenons glued and the whole assembly tapped together with a mallet and block and finally cramped up using pads for protection the wood. Next the front legs and front rail are glued, assembled and cramped up. Now bring the front up to the chair back by fitting the side rails in between. Cramp up and place on a known flat surface such as a saw table and check it is sitting flat on all four legs. A minor wobble can be dealt with later if necessary. Check all joints are closed and the whole chair is square (relative term I know!). Clean up and leave the glue to set. There are four corner blocks which help to lock the chair rigid and make platform for the seat infill to rest on. These blocks are flush glued and screwed in place no other jointwork is needed. Cut a ply base to drop onto the blocks and cut to fit around the legs. The chair is given a final sanding and the ply seat base is upholstered with foam, lining material and your chosen fabric to complete it. You now know how to make one chair but you will certainly want a complete set. The use of jigs and performing each repetitive step on all matching components is the key. The process becomes more like a production line and faster and more efficient. "The topmost back rail is quite tall and needs care in shaping, being too wide for a spokeshave"